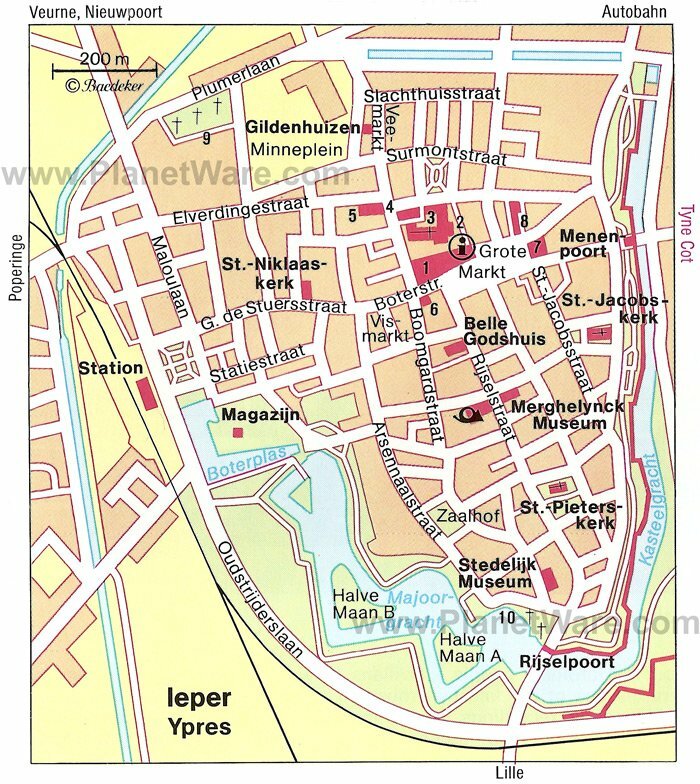 Ypres (in Flemish Ieper) is associated with some of the most bitter battles of the First World War, when the countryside around town became the site of major trench warfare, and the town itself was almost completely destroyed. Today, the cemeteries and preserved battlefields of this era are a major pilgrimage site. Ypres itself was founded in the tenth century and during the Middle Ages was one of Belgium's most important towns (together with Ghent and Bruges) thanks to its prosperous cloth making. Ypres managed to retain most of its ancient buildings and evidence of former splendor until the First World War, when Ypres stood in the line of fire and was subject to continuous bombardment by artillery. It has since been rebuilt according to the original plans. The area all around Ypres was, in the four years of 1914 to 1918, the scene of some of the bloodiest battles of the First World War. The dead are buried in 170 war cemeteries, and their graves are still visited by relatives. From Ypres, Route 14-18 is signposted to the most important battle zones. An unmarked 63-kilometer tour through the battlefields begins at the Menin Gate. Take road N345 and N332 heading northeast through one of the most hotly contested areas, past several British cemeteries and trench warfare battlefields for nine kilometers to view the major sites along the way to the village of Zonnebeke. Completely destroyed after the war, it now has an attractive church with a freestanding belfry dating from 1921. The huge Lakenhalle (cloth hall) takes over one side of the central Grote Markt square. The original building was begun around 1260 and completed in 1304 but it was completely destroyed in the First World War. The new structure is one of the finest and largest secular buildings in Europe. The extent of the hall in which the cloth was stored, checked, and sold, is indicative of the power wielded by the guilds within the town. Above the entrance door is the statue of the patron saint Onze-Lieve-Vrouw-van-Thuyne; in the niches are statues of count Baldwin and Mary of Constantinople together with King Albert I and Queen Elizabeth. One of the most distinctive architectural elements to the Grote Markt is the 70-meter-high-square belfry which projects from the center of the Lakenhalle and is visible from the surrounding countryside. Its carillon of 49 bells plays from June to October at 9pm. From the tower, which is a UNESCO site, there is a superb view over the plain of Flanders. Opposite the Lakenhalle to the south, on the corner of Boomgaardstraat, stands the Nieuw Vleeshuis (meat hall), dating back to 1277, where meat was sold on Saturdays until 1947. At the north end of the Grote Markt on the left is the Kasselrijgebouw (Old Town Hall) with the Seven Deadly Sins represented in the gables. From the east end of the Grote Markt it is just a short distance to the Menin Gate, built by the architect Sir Reginald Blomfield on the site of the medieval town gate, through which the British soldiers marched to the front. The Menin Gate is the starting point for any battlefield tour and today, the gate serves as a memorial to the First World War with the names of the 54,896 British soldiers who were killed or missing in action inscribed under its arches. Every evening at 8pm since 1928, the Last Post is sounded here. Behind the Cloth Hall to the north stands Sint-Maartenskathedraal. The church was originally built in the 13th century and its south entrance and tower added in the 15th century, but having been completely destroyed during the war, the church was totally rebuilt in 1922. Its large-scale proportions are reminiscent of the monumental French cathedrals with the tower more than 100 meters high. Inside, you can view some art treasures that survived the bombardment of the war. In particular, the church is home to a brass font (dating to around 1600) and the picture of Onze-Lieve-Vrouw-van Thuyne that is traditionally believed to have miraculous powers. Also inside the church are the tombs of Bishop Jansenius, the founder of Jansenism; Georgius Chamberlain, sixth bishop of Ypres; and Count Robrecht of Bethune. The church's glass paintings are a present from Great Britain to commemorate the war losses. North of the cathedral, opposite the Ypres Schouwburg theater on the corner of Vandenpeerboomplein, is St. George's Memorial Church. The Anglican Church commissioned Sir Reginald Blomfield to build this church in 1927 to commemorate the soldiers of the British Commonwealth who were killed in battle in Flanders during the First World War. The entire interior of the church, together with the statue of St. George and the plaque with the famous poem "In Flanders Field," was funded by Great Britain and the Commonwealth. The Merghelynck Museum is housed in the old home, dating back to 1774, of Frans Merghelynck, who was once the treasurer for Empress Maria Theresia. Part of the splendid Louis XV and Louis XVI interior survived the First World War and is definitely worth a look. Diagonally opposite the Merghelynck Museum is the 13th-century Steenhuis, now a post office, the only stone building left standing in Ypres. At the south end of the Rijselstraat, a narrow street leads off to the right to the Stedelijk Museum, which functioned as a hospital for the poor in the 13th century and now documents the town's history in a series of exhibits. The Rijselstraat ends at the Rijselpoort (also known as the Lilletor), a massive fortified gate from the Burgundian period. During the First World War, the British general staff had its headquarters in the casemates. Near here, the gate ruins of the old ramparts can still be seen. For tourists interested in Ypres history, a walk along the fortifications is a must. Not far from the gate, just inside the ramparts, is an interesting attraction - the 16th-century "Houten Huis," a painstakingly restored example of one of 90 traditional wooden houses in the area. Near the hamlet of Nieuwe-Molden is the largest British war cemetery in Flanders. Tyne Cot Cemetery was laid out by Sir Reginald Blomfield with almost 12,000 war graves and a memorial to 35,000 soldiers missing after August 16, 1917. The location affords one of the best views of the former battlefields. From the Tyne Cot Cemetery, a narrow road leads to the N313. A short distance south of the junction, at the crossing with the road to Langemark, a memorial commemorates the 2,000 Canadians who died in the first German gas attack in 1915. About three kilometers from the Canadian monument, the pretty village of Langemark was much contested in the war and has a huge German war cemetery (almost 45,000 graves). At Langemark, in 1914, thousands of young, inexperienced recruits, mostly students and schoolboys, lost their lives; a fact which was exploited by the propaganda machine of the Third Reich and even today can be seen as being symbolic of the spontaneous willingness of youth to make sacrifices. From Langemark, return towards Ypres, past the British cemetery of Cementhouse, to Boezinge with a view of the silhouette of Ypres. At De Klijte (10 kilometers from Dikkebus), turn left to arrive at the village of Kemmel; two kilometers southwest of here rises Kemmelberg, the easternmost spur of an upland range in West Flanders that was much contested during World War I. There is a panoramic view over Ypres and the plain of Flanders from the top. A large French communal cemetery (about 5,300 graves) with a memorial crowned by the Gallic cockerel lies on its western slope. In Mesen, five kilometers beyond Kemmel, are several war cemeteries. The elevated ground north, between Mesen and Wijtschate, was taken by the British in 1917 by massive mine blasting. One of the largest mine craters of that battle, Lone Tree Crater, is now a small lake and is preserved as a memorial, known as the Pool of Peace. From here, you can continue on the N365 north, back towards Ypres. Some five kilometers beyond Wijtschate, a small road turning off to the right leads to the village of Zillebeke and to Hill 60, four kilometers south east. It was an important artillery observation post and the center of heavy fighting, now crowned by two British memorials.